Submitted by Norm Roulet on Sat, 10/02/2010 - 23:41.
most recent two summers and winters. Given the association of extreme weather and climate events with rising global temperature, the expectation of new record high temperatures in 2012 also suggests that the frequency and magnitude of extreme events could reach a high level in 2012. Extreme events include not only high temperatures, but also indirect effects of a warming atmosphere including the impact of higher temperature on extreme rainfall and droughts. The greater water vapor content of a warmer atmosphere allows larger rainfall anomalies and provides the fuel for stronger storms driven by latent heat. Extreme events, by definition, are on the tail of the probability distribution. Events in the tail of the distribution are the ones that change most in frequency of occurrence as the distribution shifts due to global warming. In other words... "if the question were posed as "would these events have occurred if atmospheric carbon dioxide had remained at its pre-industrial level of 280 ppm? ", an appropriate answer in that case is "almost certainly not." That answer, to the public, translates as "yes", i.e., humans probably bear a responsibility for the extreme event." 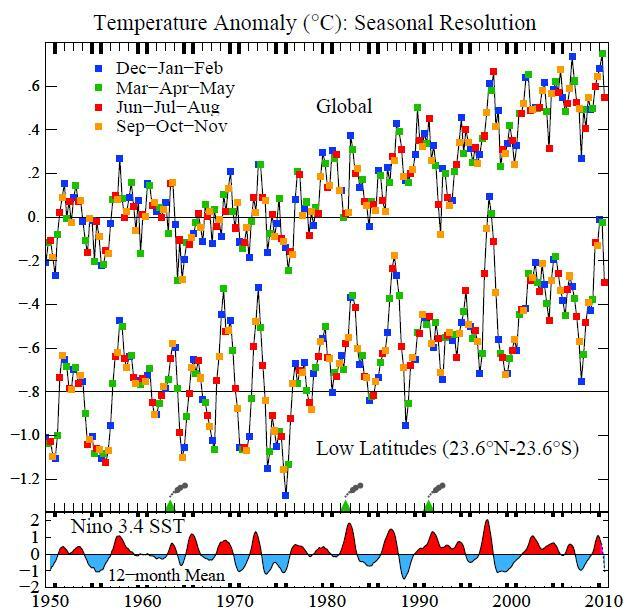 Read the complete analysis by Dr. Hansen below... and watch out for 2012! 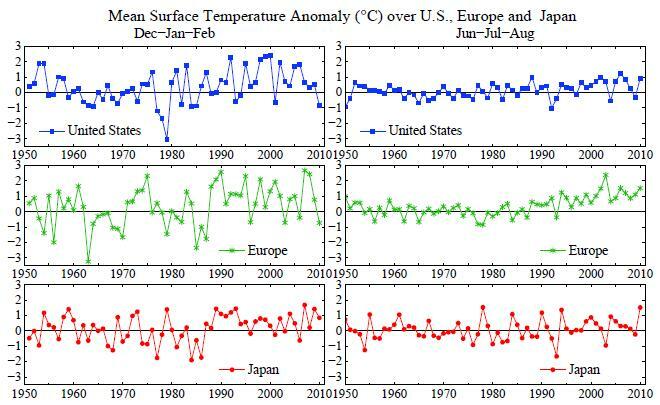 Dr. James Hansen - How Warm Was This Summer? Hemisphere summer) for the past two years. 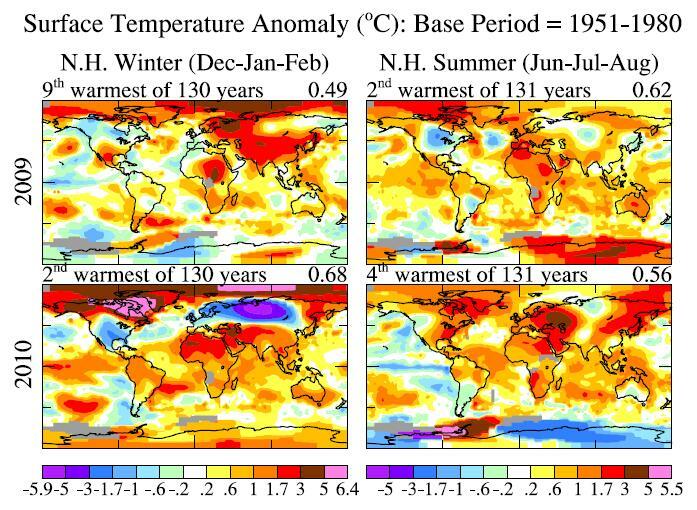 winter temperature anomalies are very noisy, fluctuating chaotically from year to year. summer, except the Pacific Northwest, which was cooler than the 1951-1980 climatology. approaches for estimating temperature anomalies in data sparse regions, as discussed in Rev. Geophys. preprint. anomaly would be comparable to the warm anomaly in 2003.
most extreme Arctic Oscillation in the record. enough, you should be able to notice a trend toward warmer seasons. if an extremely warm summer anomaly occurs there again within the next several years. and for low latitudes. Nino 3.4 index is as defined in Rev. Geophys. preprint. tend to reflect Nino variability, with, on average, a lag of about three months. index that we use and other details can be found in that paper. 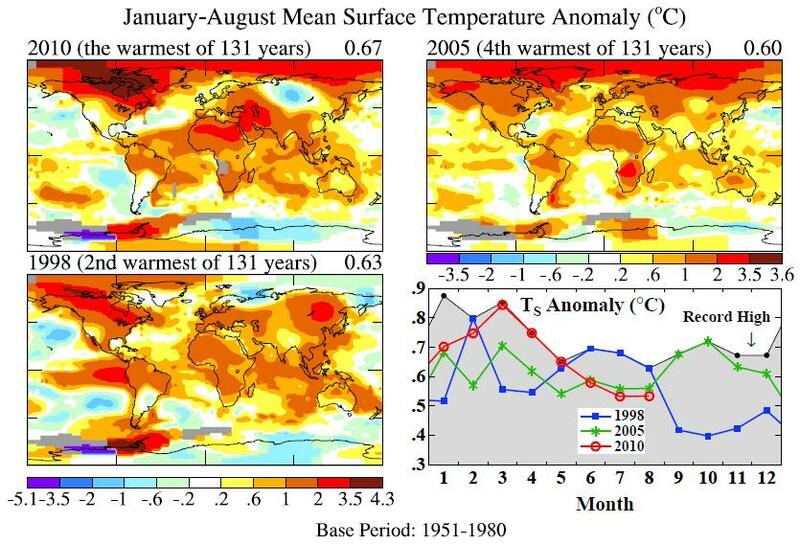 years in the GISS analysis, and comparison of global monthly anomalies for those years. 2010, as shown in the Rev. Geophys. preprint. temperature, it is unlikely that 2011 will reach a new global record temperature. larger rainfall anomalies and provides the fuel for stronger storms driven by latent heat. warming." That answer, to the public, translates as "no". probably bear a responsibility for the extreme event. public, is chatter. The initial answer is all important. 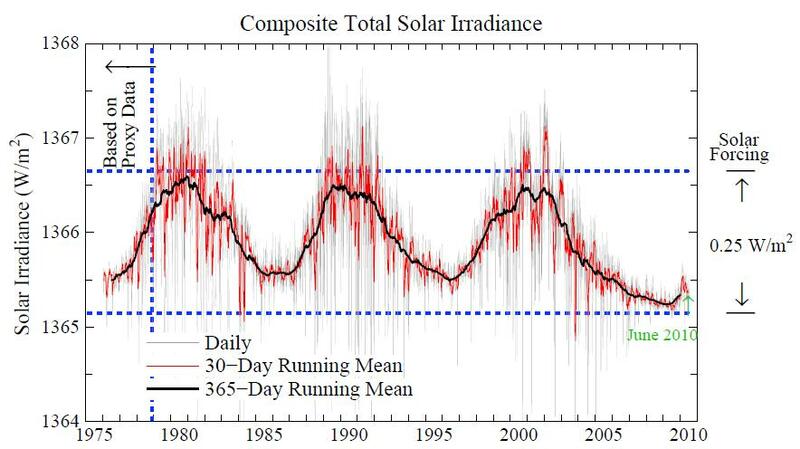 frequency of occurrence as the distribution shifts due to global warming. occurring several times a century, along with a good chance of at least one 500-year event.